Over the years I have handled many knives, however I believe one of finest automatic and manual knifes were from GT Knives. I am a certified knife nut and have what some would classify as a museum class collection off all things edged and I was there in the late 1990s during the heyday of premium knife manufacturing. At that time we saw the price was no object brands like TiKnives and Masters of Defense which have faded due to either acquisition or simply went out of business. Disappointingly the market seems to be more caught up in making a huge breadth of trendy designs versus a few very high quality pieces. The original GT Knives was actually started by a plastics company which created both GT Knives and the wildly popular switchblade Divix Golf Tool. 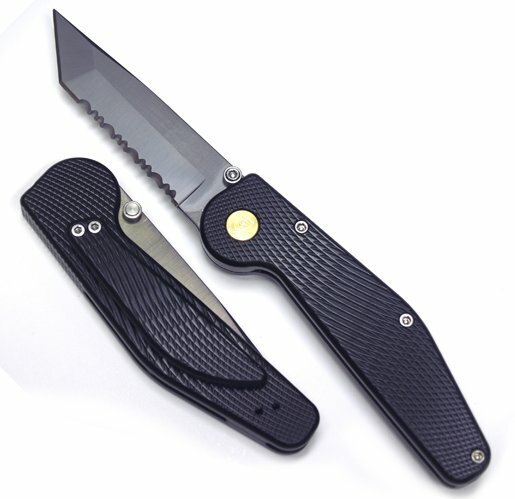 Although a brand famous for extremely high quality, a butter smooth action, outstanding ergonomic, an innovative and patented button locking mechanism, extremely comfortable billet aluminum handle, and one of the most reliably automatic opening mechanisms in the industry, GT Knives floundered a bit due to the enthusiasm of the management in the finicky knife business. That lead to long back order cycles and a large reduction in their models and variations and ultimately a gap in GT Knives existence until I was thrilled to find out that the company was recently purchased and relaunched by Mantis Knives complete with the same exact original equipment used by GT. Now in 2012, I am happy to day the famous GT Knives brand and quality lives on and picked up an automatic GT Knives plain/serrated combo drop point blade with a olive drab green handle. Typically when a knife manufacturer is purchased, you start to see tweaking or tuning of the design by the new ownership, which is usually to hit a price point... the end result is quality of the “new and improved designs” generally suffer. In the case of the new ownership of GT Knives, they have left everything alone with zero changes to the original design and materials and added back in the olive drab green color in addition to the standard black. These CNC machined handles are very precise and far above the quality of many other “high end” knife brands on the market today. The Type III anodizing is superb. Whoever does their anodizing is outstanding. Probably the most noticeable trait is the milled textured finish which is grippy and looks exception. 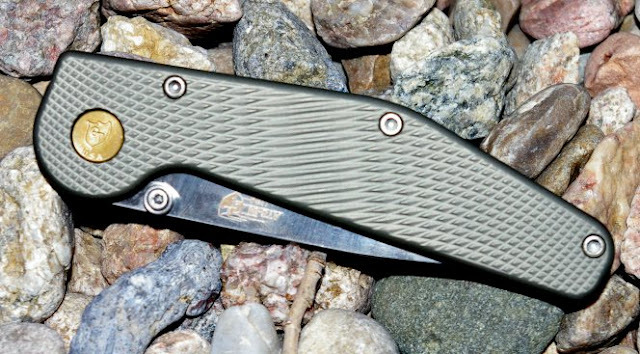 All around a the knife easily hits the expectations of a $220 folder. It was my understanding GT Knives has a shinny blade finish however the stone washed finished I chose is quite good and resists marks during use. Automatic knives (more commonly known as switchblade) are not legal to own and carry in all states; my state for instance has no restrictions what so ever and allows me to carry an automatic knife legally. Some states only allow collection, while others limit ownership only to police and law enforcement or prohibit ownership completely so check your local laws. I guess somehow, pushing a button to deploy a knife is more deadly than the mirad of one handed opening knifes available. Luckily if you don’t live in a free state, GT Knives has manual versions of all their knives as well. GT Knives provide you with a large variety of options including choice of black or olive drab handle color, plain, fully or or partially serrated blade, tanto or drop point, and blade finish of polished, satin, or black nitride coated. As GT Knives now makes every knife to order, you really have a broad selection of options to choose from and can get your knife exactly how you want it such as this fully serrated tanto version. Some of the features I really like are the comfort of the handle which may look a little different, is infinitely more comfortable than 90%+ of the current crop of “tactical knives” on the market. It is also more practical with a built in guard and grip that will assure your hand will not slip onto the blade during forceful jabs. The 6061 billet aluminum pocket clip is reversible for tip up or tip down carry. The GT Knives are definitely classified as tough hard use folders. Their patented button lock mechanism was taughted as one of the strongest knife lock designs made, and based on my testing, I do not doubt that even today it still is. Operation of the automatic version is simple, press the brass button lock on the handle and the blade springs open very authoritatively and upon releasing the lock, the blade locks open automatically. Closing the blade requires another press of the button and the blade can be closed by hand. The manual version requires you to press the brass button to manually open the knife. Once the ATS-34 tool steel blade is open you can start cutting. Crucible steel are leaps ahead of AUS8 and other more common stainless steel. ATS-34 very similar to 154CPM it a tool steel designed to hold a cutting edge for a very long time which it does on the GT Knives. ATS-34 is a bit more toothy than 154CPM or VG10 steels which makes for an aggressive and long cutting knife and by many is prefered on a working heavily used knife. The pocket clip is also milled from that same hard 6061 aluminum and is less yelding than typical spring steel pocket clips. The end result is that it is tougher to re-clip to the pocket, but is very secure and not going to inadvertently slip out of your pocket. During the introduction of GT Knives blade “tip down” carry was all the rage and they designed the clip to function primarily in this orientation, however the problem is that due to the button lock mechanism, you end up with a pretty high riding knife. If there was a weak point with the knife it would be that the ergonomic pocket clip is less ergonomic when turned and mounted for tip up carry. The pocket clip still works well, and provides for a comfortable grip, but is not as perfect feeling as in the stock tip down carry position. I have used the knife as my daily carry for nearly two months now and cut just about anything with it, including forcing it into meal prep duty. Remember if a knife will not function as a good cooks tool, it will fail your needs in a survival utility prep situation. The GT Knives drop point blade geometry performed excellent as a food prep knife and all around utility knife for everything from cutting chicken to prepping fuzz sticks for starting fires. It is good to see that classic knife designs such as GT Knives can not only still hold their own against all the new products on the market, but perform better than many of the newest designs. I for one would like to see GT Knives again expand and grown. The GT Knives designs were far ahead of their time in the 1990s and I can only hope that they consider keeping what works and expanding the line with a new hefty spear point blade and perhaps some updated tactical colors. Check you local laws and then give GT Knives a call to build your own custom hard use tactical folder. Button Lock Action - Locks in the open and closed position. Blade - ATS-34 1/8" x 3-5/8" heat treated 60 Rc. Custom machined knurled grip - 6061 T6 aircraft aluminum. Single handed open and close. Made in USA - Lifetime Guarantee.